WTI crude prices are back above $48.50/b this morning, after a strong upward trend yesterday that was maintained overnight. 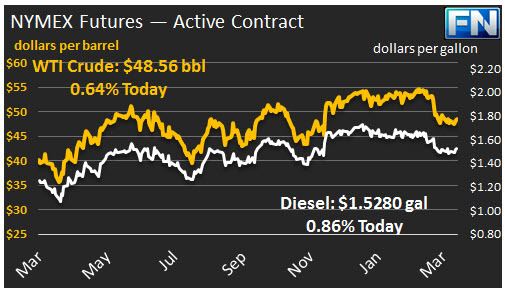 WTI opened at $48.47/b today, an increase of $0.58, or 1.21%, above yesterday’s opening price. 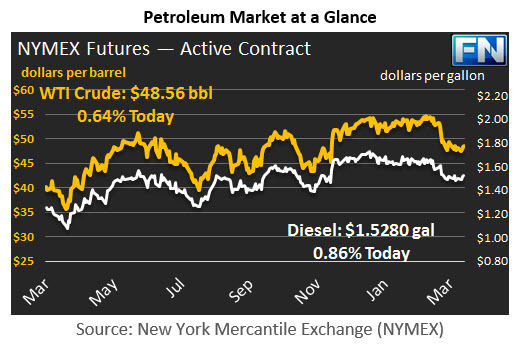 Prices are $48.56/b currently, up $0.19 from yesterday’s close. Product prices also rallied yesterday and remained strong overnight. Diesel opened at $1.5216/gallon in today’s session. This was an increase of 2.06 cents (1.37%) above yesterday’s opening price. Current prices are $1.528/gallon, up 1.13 cents from yesterday’s close. Gasoline opened at $1.631/gallon today, an increase of 1.35 cents, or 0.83%, from yesterday’s opening. Prices are $1.6491/gallon currently, up 1.42 cents from yesterday’s close. U.S. crude oil inventories appear to have risen once again, according to the API. The API’s weekly figures showed an inventory build of 1.91 mmbbls. This was more than offset by a gasoline inventory drawdown of 1.1 mmbbls and a diesel drawdown of 2.04 mmbbls. The official EIA data will be released later today. Oil prices are receiving support from a disruption in Libyan crude output. Reuters reported that armed militia have blocked production at the Sharara and Wafa oilfields in western Libya, cutting output by 252 kbpd, which is approximately one third of output. Reuters also reported that Russia and Iran have agreed to keep cooperating on the crude production cuts, giving additional credence to the idea that the OPEC/Non-OPEC production cut pact will be extended beyond June 2017. President Donald Trump signed an Executive Order yesterday which he proclaimed his “Energy Independence” order. The goal is to undo U.S. regulations regarding climate change. The order directs the EPA to dismantle former President Obama’s Clean Power Plan, which would have required states to cut carbon emissions from power plants. However, this plan was never enacted because of Republican opposition, so it is not clear whether there will be a significant shift in the electric power fuel mix. The order also lifts the temporary ban on coal leasing on federal lands, which was initiated by President Obama in 2016. In recent years, inexpensive natural gas has supplanted a great deal of coal in the power sector. According to data published by the EIA, the use of coal in electricity generation fell by 5.3% on an average annual basis between 2007 and 2016. In contrast, natural gas use grew by 4.9% per year on average from 2007 through 2016. In 2016, the amount of natural gas used in power generation surpassed the amount of coal used.